A few weeks ago, my friend Michelle asked me if I would be interested in helping her redo her front yard. She explained that her lawn was a mess, there was a military-industrial shrubbery complex taking over one corner of the yard (we call it the "horrible bush" -- Michelle's words), and she wasn't too excited about most of the other plants, either. When she said she wanted to bring more color to her yard, I knew I was going to like working with Michelle. 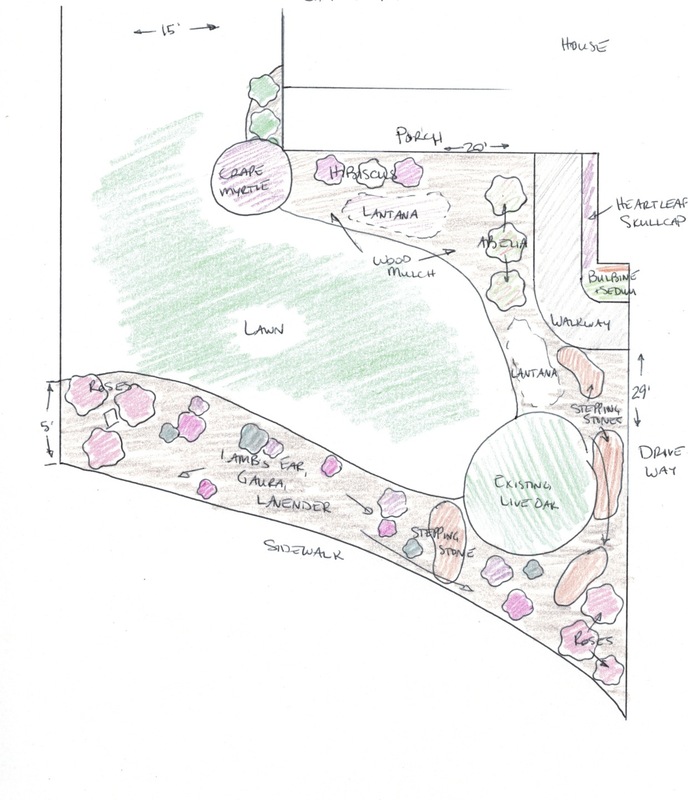 I have no formal training in landscape design (or informal training, either, really), but our own landscaping process last year was a real eye-opener for me. 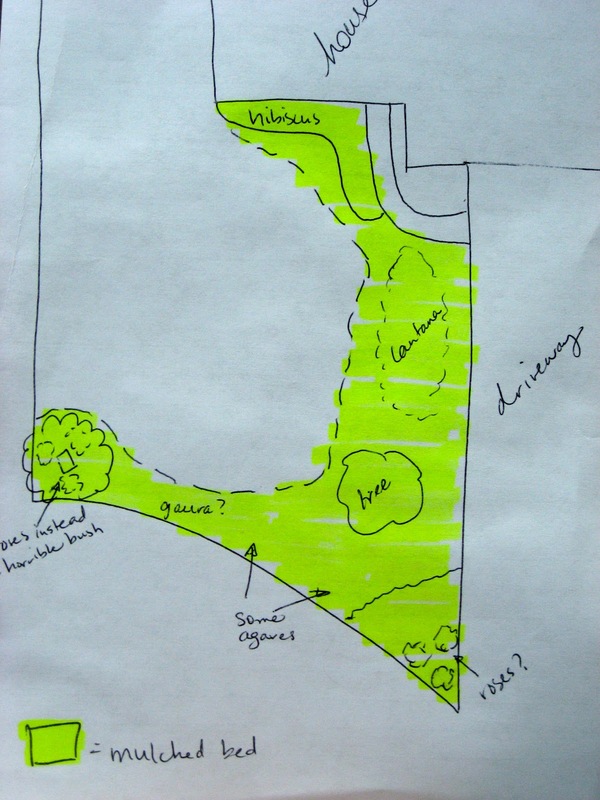 Since the beginning of construction, I had been trying to put together a plan for our own yard, but I couldn't make anything work. We ended up hiring a professional designer, and the final design incorporated everything I had struggled to include -- plus a lot of interesting lines and shapes. It was like a light bulb went off. 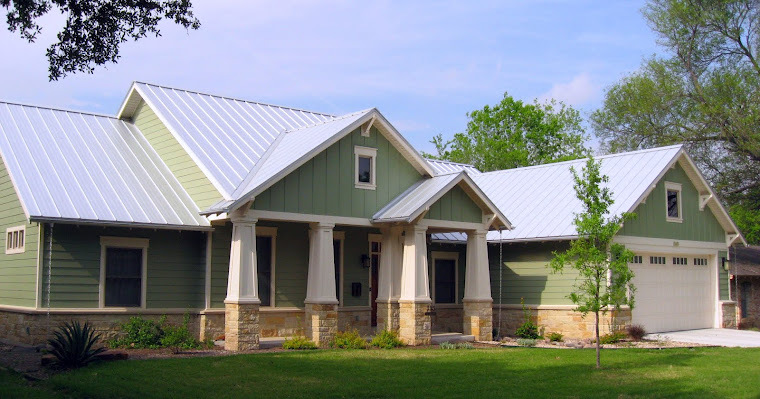 I certainly won't claim that I now know as much as our landscape designer -- clearly, I don't -- but seeing how our design was put together definitely opened my mind to how exterior space can be used in visually interesting ways. So I jumped at the opportunity to help Michelle by putting together a landscaping plan. I've only been to her house once, so before I headed up to there get a closer look at the situation, she sent me the following pictures of the front yard and its various "problem areas." There's a nice live oak tree in front of the house, but that's about all Michelle wants to keep. I know we can do better than this green tunnel up to the front door. Grass has never grown very well in this part of the yard. And then there's the horrible bush (which is disguising an electrical box that I swear is no more than two feet tall by eight inches wide and deep). She liked the general concept, but with a lot of kids in the neighborhood, the agaves made her nervous. Not wanting to be responsible for any toddler tears, I agreed that we should rework that part of the plan. A few days later I headed up to Michelle's house to check things out for myself and flesh out her needs and wants. With the agave phase behind us, we seemed to have a shared vision for the yard, so we just talked through some practical concerns (like needing to add a few stepping stones because Michelle and her family routinely walk straight from the porch to the sidewalk) and then sat down with a copy of the city's Grow Green book to choose plants. Michelle said she liked pink, white, and purple, so we picked out purple and white lantana, lavender, gaura, heartleaf skullcap, a crape myrtle, and a few other plants that would work well (most of which I have in my own yard). To screen the electrical box, I suggested three or four pink knockout roses, which we would repeat on the other side of the yard for balance. We also decided to move the rosemary that's currently between the garage and the walkway to the far side of the house (under and next to the crape myrtle). And Michelle's own research led her to Habiturf, an awesome new blend of the native and drought-tolerant grasses, for the new lawn. 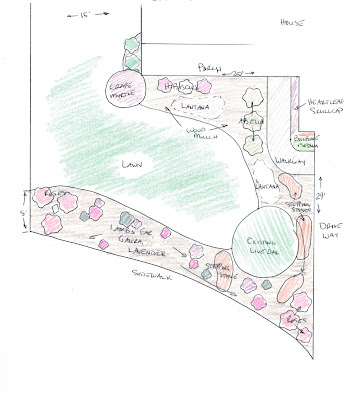 Michelle and her husband are itching to get started on the work (rumor has it they may have started removing some of the bushes before getting approval from the HOA) -- and I'm itching to share the results once the new landscape is in place.